Musings 'n scribblings of a philanthrope .. : Tiangong 1 coming crashing from space .. 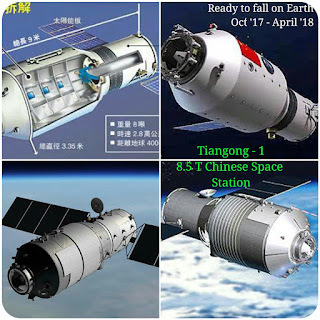 The 8.5T Tiangong I Chinese space station launched in 2011 after making 34,479 orbits around earth is coming on a crash visit (actually crashing) to earth between Oct '17 and April '18. Now it is at an altitude of 300 km ..
Tiangong 2 launched in 2016 is also in orbit. Compare this with the 77T US Skylab launched in 1979 and the 20T Salyut 7 launched in 1991.. Both of them have crashed to earth.